The Stander team just got back from the Fall Medtrade 2017 in Atlanta Georgia. At the show, we introduced our new Keystone display to HME retail dealers from around the world and received overwhelmingly positive feedback. The Keystone display is the culmination of years of retail display development. Taking up around the same floor space as a single lift chair, the Keystone display holds nearly $4000 dollars worth of merchandise. 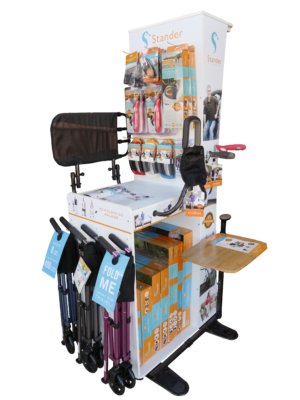 Not only are you able to supercharge your dollars of product per square foot with the Keystone, you can also display 7 products out of the box in a way that lets customers touch, and use the products before making the purchase decision! As those of us in the HME retail industry know, if a customer uses one mobility aid, they probably need others. Cross-selling becomes much easier with the Keystone display thanks to the fact that bathroom, bedroom, living room and travel products are all displayed together. If you have any questions about how to get a Keystone display for your store, please contact us at [email protected] or fill out the contact form on this website!